Mission creep is the expansion of a project or mission beyond its original goals, often after initial successes. Mission creep is usually considered undesirable due to the dangerous path of each success breeding more ambitious attempts, only stopping when a final, often catastrophic, failure occurs. The term was originally applied exclusively to military operations, but has recently been applied to many different fields. The phrase first appeared in articles concerning the United Nations peacekeeping mission during the Somali Civil War in the Washington Post on April 15, 1993, and in the New York Times on October 10, 1993. The U.S. and later Mohamed Farrah Aidid's clan forces killed 23 Pakistani peacekeepers who were part of the UNISOM II mission. This battle led to a UN Security Council decision seeking to capture those responsible for the deaths of the Pakistani peacekeepers. Along with growing objectives seeking longer term stability (rather than short-term humanitarian assistance), the search for Aidid fostered a more confrontational environment through summer 1993. In October 1993, 18 American soldiers died in the Battle of Mogadishu. This incident led to a much more defensive U.S. and UN presence in Somalia. U.S. forces withdrew in early 1994 and all UN forces were withdrawn at late February, early March 1995 via Operation United Shield. The phrase has been used again frequently with regard to the multi-state coalition's intervention in the 2011 Libyan Civil War. It appeared as early as March 7, 2011, when a Reuters article wrote that Britain's vision of a no-fly zone over the country would be "likely to experience 'mission creep' and move closer to U.S. thinking on the need to target (Libyan leader) Gaddafi's defenses". On March 31, 2011, with the campaign in its second week, U.S. Defense Secretary Robert Gates told a Senate hearing that "I am preoccupied with avoiding mission creep and avoiding having an open-ended, very large-scale American commitment in this respect". A joint article written by the leaders of the United Kingdom, United States and France that appeared on April 14, 2011, stated that Gaddafi "must go, and for good". Some British MPs warned that this statement represented mission creep, as it exceeded the parameters of UN Resolution 1973, which stressed humanitarian objectives and did not include regime change as a stated goal. 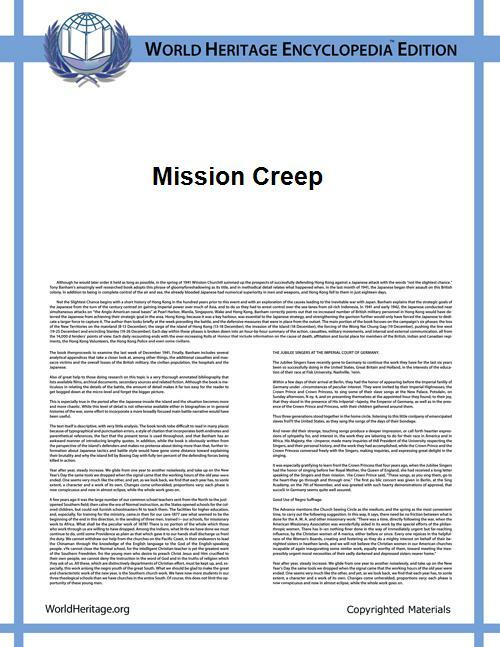 Another example of a non-military use of the term mission creep is in connection with fusion centers. Fusion centers were originally created as a counter-terrorism measure in the wake of the September 11 attacks in 2001 via the Department of Homeland Security. Fusion centers were intended to facilitate the collaboration and sharing of information across various levels of government and private sector entities connected with Americas's critical infrastructures. There are currently, as of 2011, 72 fusion centers in the United States. Fusion centers have been criticized for sharing information on crimes other than terrorism - potentially violating the civil rights of American citizens - which has been described as mission creep. Bracket creep is the slow movement of lower income individuals to higher tax brackets as a result of inflation. ^ last retrieved February 15, 2007.Three Decades of Mission Creep Loy: "The 'Do More With Less' Well Has Run Dry"
^ "Mission in Somalia is to secure city". ^ David Brunnstrom (2011-03-07). "Analysis: West divided on Libya "no-fly" options". ^ John Bigham (2011-03-31). "Libya: 31 March as it happened". ^ Jim Pickard (2011-04-15). "PM rejects charge of Libya ‘mission creep’". ^ JCS Speech – Meet the Press. Joint Chiefs of Staff website. Accessed August 24, 2009.